He's a national hero and embodies the sacrifice made by thousands of British troops who fought on the Western Front in the First World War. Harry was the last surviving British soldier to have served in the third battle of Ypres (the battle of Passchendaele) in which more than 70,000 British troops died. His life as a Tommy has been well documented by local, national and international media and press, including a documentary on BBC1 called The Last Tommy. Read your memories and tributes to Harry Patch here. I was privileged enough to meet Mr. Patch in London at the Armistice parade last year. All I could do was thank him, while biting back tears of being so overwhelmed by his presence. He squeezed my hand and met my eye, and in that moment I knew that while I will never have to do what all those brave men did in those terrible years, I have my life, my liberty and my honour because of them. And sit and smoke to pass your time? How many of you looked to where I do now? Such years ago, but the same sky, anyhow. Did you laugh and joke and cry out valiant tears? Did you think of me, when you thought of sacrifice? For every second chance I have, and every passer-by I wish that I could tell you now, how much I value sky. I was very moved by "The Last Tommy". For me, what I have gained from my extensive study of the World Wars, and the American Civil War is an understanding of how good we really do have it. Thanks to people like Harry for making the ultimate sacrifices that continue to allow many more in the world to live Free. Thank You Harry! You are my hero! Harry Patch spoke with great dignity on his life as a soldier in WW1. It's a shame that those in government and the royal family fail to inspire us as much as did. When the next honours list comes round with it's usual list of celebrities and civil servants, I hope the polititians and royals will feel guilty that a truly inspiring man was ignored. Researching my own Grandfathers WW1 history on the Somme brought me to Harry Patch - The Last Fighting Tommy, clearly he was a reluctant soldier but a soldier who did what he felt was his duty nonetheless, just like my Grandad and having read so much just lately about the dreadful conditions and dangers all these men faced it is little wonder Harry took so long to speak of his time on the 'front'. My great grandfather George 'Jubilee' Smith, died on the Somme age 19. My late grandfather never spoke about him, but on our visit to Thiepval memorial in 1999 with my mother and father we felt a great connection. Remember the dead for they saved us; but also remember the living and remember that wars will continue till we as a race learn to talk, accept our differences and replace greed with kindness, fear with hope and hate with love. God bless Harry Patch and his peers. Don't worry Harry, we won't let the War and its lessons be forgotten. We promise. After visiting the Somme battlefields twice i have come to know harry in great detail.but now there is no-one in the world who can directly recall eyewitness accounts of the trenches of the great war we now only can learn this from text books. R.I.P Harry Patch, reunited with your lost mates. There was a man of many years one hundred and eleven in fact He fought for his King and country his name was Harry Patch. Our last surviving "Tommy" now he is at rest In life a very modest man and truly one of the best. He served with many others in the 14/18 war and we could never ever know the atrocities he saw. Fighting in the trenches the casualties were vast He must have wondered every day if it would be his last. He told us he was frightened and what man wouldn't be Bravery and courage is what stands out for me. We'll honour and remember him with all who've gone before. Farewell dear soldier. Whenever Last Post is played I'll remember Harry with my Scots Guards grandfather Murdoch at Ypres; now both beyond the guns dark clouds that dimmed the whole 20th century and creep now again into the 21st. Harry was an enlisted man, an ordinary chap from the rural countryside who chose to do his duty, though he thought the politics didn't cohere. He was not an officer. The Lord chose to have an enlisted man as the Last Man Standing. Think about it. I was honoured to have met Harry in 2007 and what a firm handshake he had!! An amazing man, so quietly spoken, so sincere. RIP Harry. Harry Patch, A truly amazing man. His experiences as a young man should be drummed into 18 to 21 year old idiots that we have roaming the streets of our fabulous island today. The very same island that mr patch and many of his 18 to 21 year old non hoodied buddies endured near starvation extreme discomfort and the threat of certain death every day to protect. both of my grandfathers were sent to fight and thankfully survived although i only knew one of them.in my opinion Mr Harry Patch should be honoured every November the 11th until time runs out. Watching Harry's funeral was a very moving experience, only matched by his dignity in life. RIP Harry, you've more than earned it. What a fitting tribute to such a remarkable character that Harry has inspired so much affection from so many people, the majority of whom will never have met him but who have been so moved by his words, wisdom and searing honesty. I like so many have a great uncle who was killed in the 1st battle of Ypres and after reading the book 'The Last Fighting Tommy' was inspired to find out more about my ancestor. This is surely Harry's legacy in insuring that future generations will remember for we must never forget their sacrifice but he also taught us all so much about peace and reconciliation and the endurance of the human spirit. All this from such a gentle, noble and modest man who at last can rest in peace with his old comrades. Harry Patch's message of peace will remain important in the years and decades ahead. The world is lucky that after one hundred years of life, he decided to tell his story. My Grandfather fought at Vimy Ridge (with the Canadian Corps), and after the war, he was never anxious to talk about it either. My Father fought in the Great War and lost his only brother in Flanders. I was, thus, brought up with the Great War firmly in my mind and one always felt, albeit irrationally, that there would always be survivors around during my own lifetime. However, as a member of the Western Front Association, I salute Harry Patch for he was "The Last Fighting Tommy". Harry was of a generation, the like of which we shall never see again. With his passing to Eternal Rest, the War has now passed from living memory into History. And, Harry will take his place within this History. Rest in Peace, Old Soldier. I am an 48 year old punk rocker. I have massive respect for people like harry. I have visited flanders field, tyne cot cemetary, and passendeale and felt really humble. when i read about mr patch, 1 thing sticks in my mind. he said, the enemy attacked our trench, and a german soldier was in his sight, he said i shot but i did not kill him, i shot him in the leg, and brought him down, i could not kill anymore. Survived! In memory of the last Tommy, Gunner Harry Patch. 'Cause it ain't and that's no lie. For there's mud, and that's the worst. Fairs fair, we kill them too. So we fight and ask not why. The sick, the maimed, the cursed. I came, I fought, survived! From one plumber to another, Harry. A humble man who made the whole world realise that peace and reconciliation are the only ways forward. Thank you Harry, you were an inspiration to us all. Rest Eternal, and may light perpetual shine upon you. I saw Harry Patch on TV last in in The Last Tommy. It was so moving as Harry and the others told their stories of the 1st and 2nd World Wars. The stories brought tears of sadness to my eyes and even as I write this I have tears in my eyes. To think that 6 million young men went to war in 1914 and that by the year 2000 only 8 were still alive to tell their tales. The horror of the great war should never be forgotten. They gave their lives so that we may live. My grandfather was only a small boy when the 1st World War broke out and it amazes me that men such as Harry Patch and others were until recently still alive to tell their tales of their experiences. Thank you Harry Patch from the bottom of my heart. A true Gentleman and till the end! It's people like Harry that we need in this sorry world today. RIP and "Pull up a sandbag with your old Muckers"
Dear Harry, we loved you so much and got to know you for such a short space of time, I would have loved to have met you and spoke about your thoughts on so many things, not just the war, you seen so much in your great life time, my loss. Rest in peace harry i hope the thereafter brings you joy and happiness forever.god bless. His nightmares are now memories no more. The scenes he lived, too terrible to say, A tiny slice of that unholy war; The last reluctant hero's slipped away. When Harry Patch was sent to Passchendaele, With friends and neighbours marching by his side, They knew they were an army doomed to fail; About one hundred thousand young men died. Of pain and death no man should ever see. A second fight for peace and liberty. A man of peace who fought that dreadful war, Now Harry Patch will have to fight no more. We shall salute you and your fellow friends who fought for us and you. we shall remember you and fellow soldiers. I read your biography and felt I had really got to know you. You touched the hearts of many, and will be greatly missed. Fitting that a lowly private should turn out to be the last man standing. I think we should do well to listen to his thoughts on war. Rest in peace Mr. Patch you served your brothers well. Thank you Harry for your sacrifice and for what you had to endure. You are now with your comrades in peace. I wear the red poppy every year (since I was 12 yrs old - now 30 yrs plus) but know, I'll wear it and think more of the sacrifice that was made by all of those in the Great War. As an Irishman, the events of your youth and the 40,000 plus Irish who died, both north and south of the island of Ireland were brushed over in our history. Shame on those who did so. Again, thank you Harry. R.I.P. The death of Harry Patch has moved me as my father was only 3 months younger than Harry and also fought in the trenches at Passchendaele. My father never spoke of his experiences so hearing Harry Patch's words give me an understanding of what my father went through. I admire how Harry held no malice against his former enemy and spoke out for peace. Bless you Harry, the last of a great generation that must never be forgotten. Rest in peace Harry. Your sacrifice has left myself, wife, 2 children, and so far 4 grandchildren able to live our lives in Peacetime. In that respect we, who have never met you, owe more than we can express. I would wish that your autobiography should be me made compulsory reading in all Schools at GCSE level. God bless you Harry for your compassion, comradeship and for the way that you have shown me and the rest of the human race that life and living should be in peace and harmony. Lets talk and talk and talk and get things sorted not kill. I thank you for the sacrifices that you and your generation made in-order that we can live as we do. Please let's carry your memory with us by learning to communicate and get on together in peace. One day dear Harry, one day we may all realise what you did that we need to get on and live in peace. God bless you and all who have fought in all conflicts around the world. May your battles on the field and with memories not be in vain. My sincerest thanks and sympathy to your family at this time. Dear Harry Patch, I can imagine that you are probably wondering what all this fuss is about! You did not want a State Funeral, you had no time for the Act of Remembrance on 11 November, "just show business" as you have said. You have been described as essentially an ordinary man who led an ordinary life. Your experiences on the Western Front were no worse than those shared by many other soldiers. But to many of us, you represent the quintessential hero, a representative of the greatest generation. And death it's sting has lost. I've been watching the news coverage of Harry Patch's funeral with a lump in my throat. Like most families in Britain, I lost an ancestor in the First World War, and since learning about WW1 in school over twenty years ago, I have always felt quite emotional when thinking about the sheer horror and numbers involved in the conflict. I will do my best to teach my children about the sacrifice made by so many people who, like Harry, were prepared to put their lives on the line for all of us. It's just so sad that the human race never seems to learn - how many more lives? Rest in peace, Mr Patch. A truly remarkable man who has, with his good grace and extraordinary spirit, touched so many of us across the generations by his example. May his message live on in minds and hearts forever. With honour, respect and gratitude I salute you, Harry. To Harry Patch and all who fought and endured the horrors and hardships of the Great war. Thank you can never be enough - we will remember! Farewell Harry Patch the last of a generation whose sacrifice and loyalty will be remembered, always. I first heard of Harry Patch when the BBC showed the series The Last Fighting Tommies. I watched with tears in my eyes when he met the German soldier and was overwhelmed at the dignity of the man. His autobiography should be essential reading for every single person. We often read of heroes when a football match is won. The use of the word hero in that context is an affront to men like Harry Patch. The world is a poorer place for your passing. You brought WWI to life, and are the last voice that can tell the historians they are wrong or right. Your representation of the Lost Generation has left a lasting mark on our lives.Rest in Peace Harry. We will miss you. ...words seem so inadequate some how, but our thanks and gratitude need to be said to Harry and his generation, who without hesitation stood side by side to defend this country and it's countrymen. We owe you such a debt of gratitude. You were a true gentleman Harry. THANK YOU. Hope you find your mates Harry sadly missed but not forgotten RIP Mr Harry Patch. As someone whose family was directly impacted by WW1 (maternal grandfather wounded & invalided back to 'Blighty', paternal grandfather who simply disappeared in 1929 still suffering from shell-shock, and 2 of my grandmother's 3 brothers torpedoed and killed, both Wars and their damage has always been a serious subject in my family. God Bless Harry Patch. Stand down, Soldier - duty done. RIP, God bless and above all, thank you. Thank you Harry for what you did for us. My great uncle was killed in WW1 he was also a Lewis Gunner so thank you for giving me an insight into what horrors you and him endured. What a hero you were. God bless and rest in peace. Rest In Peace Harry Patch. Our last remaining link to WWI. You may have left us but you will remain in our hearts for ever. Our brave hero. I hope the world can finally learn from what you have witnessed from the atrocities of war as you lay upon us in heaven. Rest in peace hero! The roll calls is now complete, march off now boy's in to history, your duties done... Never to be forgot. Thanks for everything, from a grateful Nation. Rest in Peace. Visit the Menin Gate at Ypres on November 11th each year when the Last Post is played and the poppy petals fall from the heavens. Harry Patch and his comrades will never be forgotten! As Harry is laid to rest we should remember a quote from him "Remember the Germans..they died there as well." What a man he was, let's hope that his qualities are still living amongst us. Goodbye Harry, and God bless you - may we never forget you or your message of peace. In America, contrary to some comments you broadcast, we are taught quite a lot about WWI, in addition to WWII. In fact, many high schools (secondary schools) around the US support a traditional foreign exchange student club and national organization, the American Field Service (AFS), founded by WWI ambulance drivers like Mr. Patch. I attended the same high school as famed WWII General McArthur (credited with rebuilding Japan, our former enemy), and felt honored to be selected by my small community (Piedmont, CA) to be a summer program (two months only) AFS student between high school and college. I and 16 other young Americans spent the summer in Kabul, Afghanistan. We took an excursion to see ancient Buddhist monks' caves with their elaborate meditation paintings and tall Buddha statues in Bamiyan (since destroyed by the Taliban). After September 11, 2001, I contacted the AFS headquarters in NYC (New York City) to learn how to try to be in contact with my fellow Afghanistan AFSers. I felt sorry that I had done so little to try to promote peaceful understanding regarding Afghanistan upon my return, and that the lengthy Russian and mujahadeen wars had ultimately escalated to involve the attack on New York (where I had lived while attending Juilliard for my masters in violin), so reminiscent of Pearl Harbor. Fortunately the kind AFS advisor assuaged my unrealistic "guilt". One more thing: As an ambulance driver, Mr. Patch saw so much biological suffering that medical science has since progressed to be able to eradicate (through antibiotics, etc.). Hindsight and improved medical science has shown that during my short stay in Kabul, I contracted Borrelia bacteria (strains of which in the US cause "Lyme Disease") from ticks, which fell off mice that scampered over my feet during sleep, attracted probably by the bits of sweets given to me lovingly by Madaar (Mother), which I kept in my suitcase under the bed. Mr. Patch would surely agree that a major effort to preventing war and human suffering must be to support continued medical research, especially to ameliorate emerging epidemics such as worldwide "Lyme Disease", drug-resistant malaria and tuberculosis, and parasitism. All of these problems know no political boundaries, and affect rich countries the same as poorer ones. Thank you, Mr. Patch; my Flying Tiger, Purple Heart, uncle-I-never-met (lost over Burma); my Vietnam Vet former brother-in-law; all veterans of all wars; children, civilians, and all us of injured by war--especially emotionally and in our collective psyches. May Mr. Patch's views predominate and his spirit live on. Harry was an amazing gentleman. This award (honorary Fellowship of the Chartered Institute of Plumbing and Heating Engineering) is granted in only a few instances and given to individuals who we feel have made significant contributions to the plumbing and heating engineering industry. The whole nation had huge respect for Harry and we felt it was only right that we should recognise his long service to our industry and the country. The plumbing profession has lost a great elder-statesman. A tribute to Harry Patch in the words of my late grampa, Somerset's 'lost' war poet . RIP Harry. Thank you for your sacrifice. I pray that war will never be forgotten, as a lesson to us all. U.S. General Douglas McArthur said it best..."Old soldiers NEVER die, they just fade away." God Bless You Harry Patch. I am very sad that Harry Patch is no longer with us. He was an inspiration and a living testimony to all those men who fought in the Great War. I am also happy however, that now he can rest in peace and those demons wont haunt him anymore. Many people do great things and are never recognised for what they have done Harry bore this with the greatest of humility and in doing so, became the hero with a name and he deserved that. I am sad that you are gone, happy that you lived and forever in your debt for what you and your generation did for all of us. God bless Harry Patch. In the simplest of words to Harry and a whole generation now gone: "Cheers Lads"
The sacrifice, the horror, the humility, the comradeship, the sense of duty, the dignity and the love of mankind. All these words encompass the spirit of men like Harry. I have studied WW1 extensively and wonder how our weak and materialistic generation would stand up to the deprivation and sacrifice that all combatants faced during those terrible days. A note to all MP's fiddling expenses - did Harry and his generation sacrifice themselves so you could have your moat refurbished....don't think so...be so, so ashamed. It feels almost ridiculous posting a comment here in this day and age remembering an incomprehensible world that people like you lived and fought in. All I can say is thank you Harry and everybody who fought in these wars and may you all rest in peace knowing the sacrifice that you made for people today. For Harry Patch, Alex Brebber and all the fallen on both sides of the trenches: Requiem æternam dona eis, Domine, et lux perpetua luceat eis. God bless and rest in peace dear Harry. Condolences to the family at this difficult time. A very special gentleman, the like we will never see again. We will all miss you and we must never forget you and the immense sacrifice that your generation made in the first world war. The guns have finally fallen silent on the western front but this must always be remembered. In Britain we treat elderly people and veterans shabbily. In Europe they honour their veterans and it is very poor that fifth rate footballers and so called pop stars get honoured and the remaining veterans did not even get an MBE. Shame on our Government. Henry Allingham, Harry Patch, Bill Stone and all those millions of others who laid down their lives for us or lived till very old age- you are the real heroes. I can never thank you enough for fighting in WWI and for speaking such an eloquent message of peace. Your story gives me a renewed sense of awe and respect for my great-grandfather, James Calvert, who flew in the RAF in WWI. If only it didn't take war to remind us of how blessed we are to enjoy peace and prosperity. I pray that you will rejoice in God's eternal peace with your friends. "Well done my good and faithful servant..."
Rest well Harry. May the flashing lights which reminded you of the trenches for nearly a century, never bother you again. I find it amazing to think this man is being buried today, in 2009. He was in the same Regiment, Duke of Cornwalls Light Infantry where my Great Uncle was a Sergeant. He unfortunately was killed at the age of 25 in 1917. He is buried in Doiran Military Cemetery in Nothern Greece. We only found this out this year and my brother took my father out to visit his father's (who also fought in the war to end all wars)brother's grave, the first member of his family to visit his grave. My father is the last of his nephew's alive (he did not have any children of his own), the other two, including my grandfather's first son who he named after his late brother did not live to find out where he rested (we thank the CWG Commission that my father was able to). We hero worship far too easily in this day and age, and whilst Harry might blush that we use such a word to describe him, he deserves it in a way that's hard to articulate. I'm not sure we can ever repay such a debt as we owe to Harry, not only for his sacrifice, and those of his friends, but for the message he decided to pass onto the younger generations: War is abhorrent and we should never let it happen. Maybe one day we'll take the lesson to heart, and create the world that honours all of The Fallen. To Harry himself, I hope he has found the peace he deserves, and that those tragic memories no longer haunt him. RIP. You were every mother's son. And your silent Lewis gun. Shot and shell and fire. Fields gone to his rest. He has gone to join all the rest of the heroes but like them will never be forgotten, rest in peace Harry. There is something ineffably moving about the simple dignity of Harry Patch and his message of pacifism that transcends the evils of this world. There could hardly have been a better representative of those who so nobly served in that wretched conflict. RIP. Thank you to Harry, Henry Allingham and all the other soldiers who risked their lives for us. God Bless you all. A True Legend, you will be missed Harry. Rest In Peace. The epitome of true Britishness, courageous yet humble and a true gentleman. He didn't let the horrors he witnessed make him bitter or aggressive. Rest in peace Harry, those horrific memories are gone. WE MUST NEVER FORGET HARRY AND HIS MATES AND THE SACRIFICE THEY MADE, NEVER! We've never had the privilege to have met with Harry, but he should know how thankful we are to him and all his peers. It makes all of our young generation realise how lucky we are when the horrific tales of war are told. May he rest in peace. May the demons of WW1 demons finally let you rest in peace. God Bless! For all that you did to give us we give you our thanks. We were privileged to hear the voices of Harry Patch and a few of his comrades in arms. We heard the voices of the Elders speak the horrors of the trenches. We heard them speak the squandering of young men's lives all for the egos of those who never faced bullets, mud, lice, torn flesh. Have our "leaders" listened as a new century dawns? We have heard but have we listened? Mr. Patch has died. The First World War is now truly history. Have we listened? If we listen, Mr. Patch will stay with us. He is every man. He was there. He is our grandfather. He knows important things. Let us listen. He has taught us our duty: Do not let this century begin the way the last two did. Will we listen? Harry has been laid to rest today, our last tie to those who fought and died for us all those years ago. My great grandfather died during the early months of the First World War and hearing Harry's retelling of those terrible days has made me think about what my great grandfather suffered. I hope now, that Harry has been reunited with his friends and loved ones, who he never forgot, and that we may learn from the past so we might achieve a brighter future. God Bless you Harry. I do not have a faith - but I hope their sacrifices are held forever - a gentleman to the end - time to be re-united with your lost friends R.I.P. We owe them a debt that can never be repaid. They went with songs to the battle, they were young, Straight of limb, true of eye, steady and aglow. They were staunch to the end against odds uncounted; They fell with their faces to the foe. Rest now, a truly great man of our time. Harry, so many people have put so eloquently what you stood for and why you are a hero. For me your story is the only real memory of hearing first hand what sacrifice was made and why war should be avoided. My grandfather, whom I never knew, died from the trenches, at the Battle of the Somme, in 1916. His body is buried at the battlefield. I am from the Isle of Wight, where still lives my brother-in-law, who landed at Normandy - on D-Day +3. My other grandfather, also from the Isle of Wight, served in the Royal Navy, in WWI and in WWII. He was injured and retired from the latter, and never really recovered, dying young. My own professional friend, Harry, was a WWII bomber pilot, who later participated in The Great Escape. My own service was the easiest and least brave - National Service in the RAF Police, in 1953-55. Harry represents all of those who died and those who survived. Some of his bravery, courage, compassion and wisdom is in every man and woman who remembers, or in those who never can. Thank you Harry and rest in peace. I will miss Harry Patch. He was a different generation to me he felt like part of our generation. His respect of other countries and soldiers, spread the ideas of peace and reconciliation. He connected with everyone and made sure that all the lives lost in WW1 were and never will be forgotten. Rest in Peace and God Bless you Harry Patch, you will never be forgotten. May your memory and the memory of millions of other like you, never be forgotten by future generations. The likes of you will never walk English Green Hills again. Rest In Peace. As I am writing this I am teary eyed, reading such wonderful heartfelt tributes and thinking of how much you have been through in such a long life. I have never been so touched or saddened by any man's story but yours. All I can say is thank you for your bravery and thank you for your inspiring story. Such a gent and true hero who went to war as a young soldier to fight for his country...the ultimate sacrifice. I only hope that we will remember the horrors of war and what pain it can bring, but also we must remember the debt and gratitude we owe to those who do fight. We will never forget the fallen and we will never forget you. Rest in peace Harry Patch...you deserve it. At only 17, I have no comprehensible knowledge of the bravery and heroism that Harry possessed. I have the utmost respect for a man that gave so much for so many. My partner and his friends grew up in Wells and when we've had the chance to meet up, the end of the night was met by a salute to the great man that was Harry Patch outside Fletcher House. I have been touched by their upmost respect for such a great, great man. We could learn so much from his dignified manner. God rest Mr Patch, there is another star amongst the skies now. Soon the voices of World War One will fall silent and it will become the realm of the historian, but the words of Harry Patch will remain a testament to their acts and deeds. Good luck Harry and Thank You, and your friends who gave up all their tomorrow for my Today. Thanks you and rest in peace. Harry Patch may you R.I.P, old soldiers don't die, they just fade away. If our major world leaders were - Ronald Reagan, Boris Yeltzin and Boris Johnson, and Harry the head of the armed forces what a wonderful world it might be, God Bless you Harry. Harry must remain an inspiration to us all. His belief that war is wrong should be everyone's word. If only the world was run by people like Harry. In a very few years we'll be seeing the passing of the last WWII veterans and thanking them of their sacrifice only 20 or so years after Harry's pals. Every year I am sickened to hear that people of my generation know or care little for the sacrifices made in the war. Harry, your generation will never be forgotten, and it is thanks to you that we will always remember those who gave themselves for the freedom that we all enjoy today. May you rest in peace with those who you lost to long ago. With his passing we not only loose the "Last Tommy" but we loose a living, breathing reminder of the futility of war and the price we pay for the greed and stubborness of politicians and despots. May we all remember him and the price to mind, body and soul that he and so many others paid so that we can have freedom. Rest in Peace Harry Patch, the nightmares are over, the dawn has come. I always remember hearing an interview with Harry Patch a few years. I was very moved by his graphic but largely unsentimental recollections. It was really a tirade against the horrors & insanity of war. All war, was in his view a waste of human life. Then yesterday I heard the extraordinarily moving piece from Radiohead on R4. I cried. Perhaps thinking how lucky I am with 2 sons aged 23 & 25, who have never & will never have to face the horrors of trench warfare. I salute you Harry Patch for telling the truth about war! Please say Hello to my Great Grandfather who died in the 3rd battle at Ypres. After visiting the Tyne Cot Cemetery at Passendale many times now, to remember all the war dead, it still makes me cry. Farewell Harry Patch, reunited with all his comrades. RIP. You did us all proud. My wife is in Wells with my eleven year old son and seven year old daughter to show our family's respect - not only to Harry, but also to say thank you to all those he represents that gave everything for our freedom. My son was privileged to meet Harry last year, and his concern about today was that Harry would not have wanted such a fuss, as he had said that he was a simple man who just loved his pigs! My wife texted me a short while ago, before the procession came through, to say that Wells was packed, but that there was an amazing hush over the city. God bless you Harry Patch, and all that have gone before you. Thank you so much. I have seen a lot of Harry Patch on TV recently and think what a wonderful person both my grandfathers fought in the WW1 the memories must have been the most haunting, my mother said that her father was never the same. My father's father was buried alive with the horses in one bombardment but survived, had to have his face rebuilt but he survived. These meant needed to be here now to ensure we all knew the raves of work especially the inch by inch fighting of the first world the devastation. I made sure my son went on the school trip to France to see for himself the trenches where these men spent a lot of there time. my son said it was unbelievable he loves everything to do with the history of our country. We owe a lot to those that gave there lives for us in both wars we would not have the life we have now if it were not for these great men. I echo other comments here in saying that a statue of Harry Patch should be erected in Trafalgar Square. Rather than a war memorial this should be a celebration of the extraordinary lives, lived everyday, by ordinary people. I am but 25 years old and have never met Harry Patch, I can never know what this man went through in the trenches, and do not know his life since then, but what i know of him has impacted and moved me and I feel such a sense of loss for we are now moving into the time where the new generations will not have known and lived at the same time as these brave veterans. I have nothing but absolute respect for Harry Patch and his pals and vow to ensure that my children and their children's children learn and appreciate what these brave people did for us and they will never be forgotten. I wish i had got to shake his hand. Rest in Peace. Read your comments about Harry, an Inspirational Man. I have written a song, recorded by Engelbert Humperdinck. It's theme is the "Battle for Bastogne" Sadly it's not about "The Great War", but the Sentiments are the same. Engelbert has told me he would like to donate a part of the proceeds from this Song to a charity for " WAR VETERANS: Old, New, and To Come" All VETERANS ". In Memory of Harry. Thank You , God Bless. What an incredibly inspiring and charismatic man... you have had a profound effect on myself and many others, and you will be sadly missed. You served in the Duke of Cornwall's Light Infantry... my home county. I followed in your footsteps to Bristol University to study History- of course!- where you helped build the Wills Memorial Building. My boyfriend served in Iraq and I buy two poppies every year- one for him and one for you. It's people like you who remind us of our history and teach us the importance of remembrance. If only more of my generation were like you. Rest in peace after your brave, adventurous life. The sounds of the last guns on the Western Front have now finally fallen silent with the passing of this humble plumber from Coombe Downe. As the living memory of those awful events, passes into the history books, they must never be forgotten. Friends can now be re-united, who were once lost, following that September evening so long ago. Rest in peace Harry. A dignified, true Englishman who gave so much for all of us. Harry and all his generation should and never will be forgotten. Rest now. "O valiant hearts who to your glory came Through dust of conflict and through battle flame; Tranquil you lie, your knightly virtue proved, Your memory hallowed in the land you loved". Goodbye Old Soldier - we will never forget you and your comrades. R.I.P Harry. You and all servicemen will never be forgotten. Sadly, I did not know you, but came to know of you through your appearance on TV. All the old boy's words were deeply poignant but yours above all rang with truth and conviction about the horror and utter waste of that terrible war. We owe a debt that cannot be repaid, except to remember and learn. You weren't deeply patriotic but did as you were asked anyway, making your sacrifice all the more commendable. I'll make sure my son knows about you and the sacrifice you and your mates made. No-one deserves peace more my friend, rest easy now. Rest In Peace Harry and thank you for your sacrifice. Come on BBC show the last episode of Black Adder goes fourth as a tribute and when showing the poppy fields at the end cut to Harry's funeral and dedicate the episode to him and his comrades for what they gave! You are a real hero and a gentleman, your story moved me so much. If there were more people like you the world would be a much better place. Rest in peace, you deserve it. Harry was just an ordinary man from Somerset who came to represent a generation now gone. He seemed like a very nice man and I am very proud to be from the West country like Harry. Rest in Peace now Harry, we will never forget what you and your contemporaries who fought so bravely for us. Thank you. When I read the stories of Harry Patch and Henry Allingham I feel sad that we have lost the last links to a heroic generation and I feel sadder that many of our young people today do not realise or appreciate that the lives they live of peace and freedom are down to the likes of Mr Patch and Mr Allingham and, of course, Claude Choules who together with their comrades, fought and died in the Great War or who have since passed. I think we should be naming schools after these national heroes. I had a great-uncle who died at Passchendaele in 1917. I felt through Harry Patch that that distant connection with my past still existed. It's a very sad loss to all. God bless, Harry. Your passing on my birthday upset me greatly. I will hopefully toast your bravery, and humility, for many years to come. So moved by the whole thing-must add my views. I also lost great uncles within a month in the Great War-this moved me to research my family history. How glad I did as I realise how brave this generation was. God bless Harry-say hello to my uncles up there!! I have known about Harry for some time, then came the book. After reading the book I felt that I knew him, we did the same job liked the same things. I'd like to say what a true gentleman from an age long gone and he is a lesson to us all. We owe them all so much. Harry Patch was a wonderful man from a remarkable generation. His funeral was just perfect - a true statement of love, reconciliation and peace. Requiem in pace. May nobody forget the immense sacrifices you and your fellow comrades made so that we might have freedom. You will be forever in the hearts of the nation, God bless you. Today marks the end of an era. On hearing that Harry had passed away it felt to me as if we had lost our final connection with a generation and it is for this reason that I am glad that at the age of 100 he shared his experiences of war in a book and through TV so that the current generation and future generations understand the sacrifices that Harry and his comrades made so that we can live the life we live today both. We owe them so much and I don't think we can ever really understand what they went through but we must always remember them. We should never forget. As with many Americans, I had never heard of Harry Patch before yesterday. But the sheer number of fond farewells posted here is simply overwhelming. He must have been a truly fortunate man to have made such a positive, lasting impact on so many people. I think I'll have to watch that BBC series and read his book. R.I.P. Harry. Stories like this brings a true tear to my eyes, a great man to to be well respected. God speed. Harry and those that served there country in WW1 should never be forgotten and the youth of today must be taught in detail what servicemen did for there country. The last of a generation of heroes and great men. This generation and the men and women will always have my upmost respect, and the years to come i shall always remember the cost of war. A fine man with honour and courage i can only imagine. RIP, and join your friends. I don't usually bother emailing these things, but just want to say thanks Harry Patch. I will not forget. Just before the birth of my daughter last year, I read Harry's book and I felt honoured to share in Harry's life! My family have served this country for generations and I will make sure that my daughter learns about the sacrifices that men like Harry made to make the world a safer place. May you be at peace now. Rest in Peace. Your loss as the final link with the hundreds of thousands of brave people who left these shores in the fight for our future all those years ago is immense. We are forever indebted to you all. I first became aware of Harry Patch when my family and I were at the Menin Gate in Ypres. Harry was there and I stood and listened to his words. It was a very sunny peaceful evening that belied the events of 1914 to 1918. The cemeteries and memorials across the landscape are enough to make anyone stop and think. Harry added to that with the words in his book. His life to me represents the goodness in people and he will be missed and remembered. Rest in peace Harry. I believe that Harry's requests today to have representatives from opposing armies and absolutely no weapons present (not even ceremonial ones) will do more to educate a generation about the futility of war than a thousand history lessons. His comments and interviews should be played to aggressors before any conflict is embarked upon. Well done Harry. Nice parting touch. It brings tears to the eyes to read such touching and well deserved tributes. Harry is a symbol of a now lost generation of dignified men who went to war to ensure our peace and freedom. We owe you and your generation a huge debt of gratitude. May you rest in peace, Harry, and be assured that we will continue your fight for peace. We will not see his like again RIP. I read Harry's book last year, The Last Fighting Tommy. I hope some day to have a son of my own & I will make sure he reads this book. It will teach him more about how to be a man more than I ever could. God bless you & your pals Mr. Patch, you will never be forgotten. The significance of the 11th hour of the 11th day of the 11th month is not lost with Harry's death at age 111. God bless you for your sacrifice and a life well lived. You and your generation are owed such a debt that we can never repay. Your passing breaks a living link that anyone with relatives who died in the Great War will mourn deeply. We could look at you and think "Maybe, had he lived, he would have been like Harry" and somehow the memories were closer to us. You will not be forgotten because your generations' qualities of duty, self sacrifice and love of country are still in evidence in our own forces fighting today. RIP Harry. Harry, I show your documentary every year to my students. They have to see it, to understand and to be moved by your sacrifice. You, better than any other expressed the horror and pointlessness of that conflict and our common humanity. Thank you. Although I understand he did not want to be a hero, a man who survives 80 years of traumatic memories only to learn generations to come his wise lessons on human conflict, amongst others mentioning all participants victims, irrespective of their uniforms, cannot be anything else but a true hero of mankind! Thanks Harry, also on behalf of the many veterans of conflicts that have passed since and who tell me their stories, i tell them yours. The most gallant of men comes in the humblest package. Harry Patch possessed something we in modern society seemed to have forgotten. We all should take lesson from him and live life as it was meant to be lived, never allowing politicians to again lead us down the path of making war, as so many have tried. Thank you Harry, may I become half the man you are. As a strange coincidence Harry died on the same day that Gavrilo Princip, the assassin of Archduke Ferdinand was born, the reason the war came into being in the first place. We shouldn't forget Harry and his fellow comrades or foe, god bless. Thank you Mr Patch , i'll never forget you . Rest in Peace !! Harry's 'day of remembrance' was the day he lost his pals during a battle in the war and he still couldn't talk about it without crying, even after so many years. Not forgotten, Harry, you or your pals. Thanks Harry. You will find with your mates now. thank god.. he is now with his mates i know for sure. thanks harry aged 111 until we meet again. sag mir wo die blumen sind. Marlene dietrich. Rest in peace forever Tommy, you have been through hell and survived, you fought for our freedom, risked life and limb, you watched your brothers fall but held fast, because of people like you and those who fell we are free. We will never forget the great sacrifice of those who fought for us. May you never witness another hell like the one you witnessed here on Earth, may you rest in peace forever, thank you Harry. I think it was meant to be that the responsibility of being the last British voice from the horrific battlefields of the First World War should fall to someone so humble, unassuming, peace-loving, kind and gentlemanly and someone who went about the rest of his life, living it the best way he could - believing that to be the only way to truly honour his fallen comrades sacrifice! We should remember Harry, my Great Uncle Tom and all victims and veterans of war but above all we should do this by trying to do as Harry did and live a full, good and kind life! May this be their on-going legacy! I read the last fighting Tommy only recently and have never been so moved. I can now see both world wars through completely different eyes - thanks to Harry and his extraordinary life. Rest in Peace Harry and thank you. Harry Patch's life has been a great inspiration to so many we hope that now he's gone future generations will always remember the sacrifices of his generation. Six months ago I named my son after you and was going to write and tell you Harry but didn't get round to it in time. I thought you'd be here for a while still. It felt like i'd lost family when I heard. Rest well now, we'll remember you at the gate. A truly remarkable and humble man. We have lost a national treasure but the world has lost shining light. So, so sad to see that this charming old gent is no longer with us. What stays in my mind most about Mr Patch is when he described war as '... the calculated and condoned slaughter of human beings'. To think of what he and his mates must have endured and suffered. In this era of soft living and easy access, I don't think we can even begin to imagine such things. Would have been nice to have met this very dignified man and thank him in person. Proudly you served! Quite a number of my relatives died in the Second World War. Four years ago my Uncle John passed away aged 85. He served as an Anzac and was awarded two Gold Pacific Stars for his part in the Middle East and then Malaysia down to Papua New Guinea. I was with him when he died and it was a privilege to have known and loved one so brave. When I heard the news of Harry's death I somehow felt a sense of personal loss. The last of the last had gone. May Harry, Henry, Bill and all their fallen comrades rest in peace. We all owe them a debt of gratitude. As they vanish down the line no backward glance is cast. We will be in Ypres under the Menin Gate this November once more. We will be there every November. We shall never forget the sacrifice of those who gave their tomorrow for our today. God Bless you Harry. Rest peacefully. Thank you Harry Patch, Henry Allingham and all your fallen comrades. You fought for us all, so that we could have our liberty. We owe you so much. It's a shame the British government could not find it in their hearts to give you both the honour you so deserved when you were alive, as the last veterans of WW1. Too little, too late. Thank you Harry, rest in peace with your Mates. So privileged to have met Harry years ago. A very special man and reminder of the sacrifice of a whole generation . Gone but not forgotten. Dear Harry, Onward Christian Soldier may God make you the brightest Star in the Sky so we on Earth can always remember you and your comrades for what you all did for us all. God Bless you. It is very sad that Harry has died but he has also come to represent many who came from all parts of these islands - and the Commonwealth - to safeguard our future. While we commemorate his long life we will also remember his comrades who have been dead these many years. God bless you Harry, and Henry Allingham. And THANK YOU for what you did to help keep us free. R.I.P. May God rest him - it is important that we always remember Mr. Patch, all of those who fought, and those who never came home from the Western Front, like my great-grandfather. Thank you Harry for sharing your experiences with us and giving us glimpse of something that hopefully we will never have to go through again. Your words will never be forgotten. One of the most admirable things about Harry was his humility, his refusal to be considered special, despite the momentous times and events he lived through. An ordinary man who left an honourable legacy. If only today's rulers had learned the same lessons about the folly of war. I don't have the Christian faith so I don't believe that Jesus died for my sins, but I KNOW that Harry's friends and colleagues died for my liberty and i'm grateful for that. RIP Harry, and all the others. I was privileged to meet Harry Patch when he was just 105. He came along to one of our rehearsals for the Community Play we were doing which was entitled "No Thankful Village". In the play about WW1 Harry and his Comrades were portrayed and he told us about the horrors and dreadful conditions in the trenches. Even after all the years it still upset Harry very much to recall those times. Now Rest In Peace Harry. It seems that with every passing say now a bit of living history is leaving us. Now, with the death of Harry Patch (together with Bill Stone in January and Henry Allingham two weeks ago) a little bit more has gone and the world will be a little emptier and sadder for it. I watched the BBC's Last Tommy programmes back in 2005 and was truly moved by Harry's eloquent words about his WW1 past and his hopes for the future. He was a true humanitarian who will be missed by many. basically mate, i learnt about you in a history lesson because my history teacher was abit obsessed with you and ever since that day i have thought what you have done is amazing and i would of loved to meet you. A sad day. We owe you a debt which is beyond our imagination. Thank you so much Harry for what you and your comrades did. Such a sad but wonderful parting for dear Harry, Thanks to people like Harry I have been able to live a free life. After reading Harry's life Story "The last Tommy" I have researched my own family Military history and was proud to find that a number of my ancestors fought and died in both world wars and I now belong to the Great War Forum on the web finding out more about great men like Harry. Goodnight Harry you are now back with you mates on the Lewis Gun. but you get up, amazed, watch bled bad blood run upwards from the slime into its wounds; see lines and lines of British boys rewind back to their trenches, kiss the photographs from home- mothers, sweethearts, sisters, younger brothers not entering the story now to die and die and die. You walk away; drop your gun (fixed bayonet) like all your mates do too- Harry, Tommy, Wilfred, Edward, Bert- and light a cigarette. a lad plays Tipperary to the crowd, released from History; the glistening, healthy horses fit for heroes, kings. your several million lives still possible and crammed with love, work, children, talent, English beer, good food. If poetry could truly write it backwards, then it would. Harry Patch and the other veterans were our last link with the first world war, he was a very brave man he had the courage to tell people how it was. I read the book that was written for him i couldnt put it down, my grandma lost her younger brother at ypres so Harry gave me an idea of what he went though. I was so upset when i heard he had passed away, it would have been a pleasure to meet Harry and shake the hand of a great man. God speed Harry and rest in peace. Thanks to you Harry, I'm living a life of freedom. May I be reminded, each moment, to live wisely and with compassion. Loud sounds of shells overhead fill our heads and still we wait in trenches deep with mud for 'the next push forward. Then the final shell and I lose my mates and am sent home'. Your survival on the 22nd was meant to be, so that you could marry your wife and share your life with so many. We will always remember you and although you died, we close our eyes and you are always there. thanks to you and all your mates that went before you i salute you and will never forget what you all did for us. I first became aware of Harry Patch several years ago, when I watched one of the Great War commemorative prgrammes which gave voice to those who had experienced the horror, terror and futility first-hand. Harry Patch's voice was the one which rang with the most authority. And when he expressed his vehement opposition to and hatred of all forms of armed conflict, and towards those whose political and diplomatic failures lead to it, and the deaths of so many, every word was laden with the bitter memory of sacrifice and sorrow. I owe him, we all owe him, and all those who fought for us in both World Wars, as well as those whose battlefield was here at home during those times, a debt of gratitude of which we can barely conceive. All any of us can do is make sure that we are worthy of their sacrifice. Sleep well, Mr Patch. And thank you. Truly the best. Good-bye Harry. look to kitcheners finger, to point the way. then to some foreign field, they marched away. they sang and smiled and marched, to meet the foe but what they met was Hell a Hell so deep and foul no human mind that was not there, can ever know. and lost it and regained it, once again. At last an end, a start a hopeful spring where those of us not needing to be called, can watch the game of bowl and catch. thank you and God bless you, Harry Patch. god bless you Harry Patch, may angels carry you to your eternal slumber, a role model for today's soldiers. I saw Harry last year being taken around Combe Down in his wheelchair. I was out walking my newborn daughter in her pram and couldn't help thinking of the poignancy of their vastly different ages. One person who had fought so valiantly all those years ago for the safety and freedom of this country, and here I was with my daughter barely weeks old. R.I.P. Harry, a true gentleman. The day was always going to come when the last of the last were gone from us. It does not make it any less sad however. Only one last British survivor, then the Great war will pass from living memory, and we can then no longer say thank you in person. I shall always remember Mr Patch as I pass the University of Bristol tower, which I understand Mr Patch helped work on. I shall remember at the last Remembrance, three of them together, now all sadly gone. They will be much missed and mourned on Remembrance Sunday this year, as they are now. Very sad to hear the passing of Harry Patch, but he has lived long and now he is going to the big re-org in heaven with his old mates. We must ensure people like Harry and all his mates and of course those who have suffered in more recent conflicts, even going on now, should never be forgotten. Rest in Peace Harry and may God bless you. God Bless you Harry - Britain does not seem to make men like you any more. I had the pleasure of meeting Harry Patch when he came to weston-super-mare and he spoke of what he had done and i think every one will join me in saying that what he and many have done shall and never be forgotten and i believe he was truly a great man he will never be forgotten and thank you harry patch for the sacrifice you and your fellow soldiers went through to give us the freedom we have today. Thank you Harry for explaining how a Lewis gun team worked together. My Grandfather was a Lewis gunner and your explanation brought it all alive for me. At least I have some idea of what my Grandfather was engaged in and witnessed in WW1. You have left a lasting legacy of the importance of peace. Thank you again for being so brave as to share your memories so that future generations can attempt to understand such a dreadful time in our history. I was working in Musgrove Park Hospital, when Mr Patch was admitted one night, probably in 1999 or 2000. I attended to him, and I still remember his cheerful, smiling face, despite being in distress. He asked me about India, and I think he had served in India before. I remember people in the hospital coming to look at him, as he was then the oldest/second oldest man in UK. RIP Harry, your passing brought tears to my eyes. While flicking through the numerous T/V channels we now have, I caught a documentary about "The Great War" on it were several old soldiers. Harry really caught my attention. He told about his experience during the war and after. His words were really moving and at the same time compelling. We owe Harry Patch and his comrades a debt of gratitude for all we hold dear. Perhaps now with the latest casualties of "war" we should remember them a little more. Rest in Peace Harry Patch. God Bless. I had the honour to meet Harry on a few occasions, the first when I invited him into Sexey's School to talk to Army Cadets who had recently visited Ypres and had raised over £750 for the RBL which they presented to him. The way in which he described the horrendous conditions in the trenches to the young cadets will stay with them and me forever. I was also able to invite him to be the guest of the Wincanton Royal British Legion at a branch coffee morning when he spoke gently to the packed room, and returned with a car full of "goodies", thanks to the generosity of the branch and public. Most recently I was able to visit him in his room in Wells when I delivered gifts to him and his fellow residents. I found him in his room writing a letter to a friend, and chatted to him for a good 20 minutes. A truly remarkable gentleman, and I regard it a great honour to have known him. What a great man & much to be admired. Such a great loss. May he rest in peace & watch over all our troops where ever they maybe. He did so much for us all to have the freedom we have today. RIP Harry. God bless Harry, you were part of a wonderful generation who made this country special. I will always remember you. Rest in peace. I have watched Harry Patch in the media many times and am sad to see him gone. A true hero who knew war was a pointless thing. How about putting statues of Mr Patch and Mr Allingham on the empty fourth plinth...?? By a self-confessed non-poet trying to keep the spirit alive forever for my children's sake-there could never be a generation quite like theirs again-words cannot express everything I feel. After following the exploits & life-stories of the Last of the Last for 15 years or more and having met one of them, Arthur Halestrap, I can only continue to read books & memoirs to keep my spirit alive-if they could get through this world then so can I. Having read all the tributes & thinking I was perhaps one of the few who felt this way for the last 15 years it is gratifying to know that there are others out there who feel the same. The last post as sounded for a great man. Harry Patch we are always in your debt RIP. A man I would have loved to have had as a father. Such a shame he died. He was truely an inspiration, and a living hero to me. I have never had such respect for a man. With his death comes the death of the western front and now it will only be a memory to chose who aren't ignorant enough to not care. For what he did, he is truely a hero. R.I.P Harry. May you never be forgotten. Night fall in camp, the muster, sunset, the day thou gave us lord is over, sleep well Harry Patch, old soldiers never die. I was saddened when i heard the news of Harry Patch the Last Tommy passing away. I had followed Harry's story since his TV interview in 1998 with his friend Richard Van Emden. He was 100 at the time and was as bright as a button, i guess that was what first intrigued me about the man but then listening to his stories, the horror's of war and the tragic day of the 22nd september 1917 when he lost three of his best pals and found himself injured. However that was his lifeline to get home and away from the horrors of trench warfare and not knowing if you would be shot, blown up or hit with shrapnel. He lived a long and what seems a full life and i guess not even the great man himself could live forever. Thanks Harry and God bless. The end of an era. How living history dies. People of my generation will never truly understand what happened nearly 100 years and how people who went trough this hell were able to resume a normal life afterwards. Respect, respect for Harry and all who served, lived and died in "the great war". With the passing of Mr Harry Patch, a period of our history passes from living memory. For me, Mr Patch's character symbolised the personality of our nation during the twentieth century. Despite the horrors witnessed during his time in the trenches, especially, Mr Patch remained a kind and gentle, unassuming man. We will never forget him or those who endured with him what we as later generations cannot begin to imagine. May he now find peace. I remember Harry with much fondness over 50 years ago, coming to our home to do many plumbing jobs ,growing up in Combe Down he was like me a true Combe Downer ,a lovely man who always had a cup of tea and a good chat whenever he visited us. He was known for his humour and used to tease me as a little girl with that glint in his eye. Lovely memories a wonderful man. Back to serve with your pals who went before their time, a truly great and wonderful man, as are all who have paid the price then, both then and now. RIP Harry. You were the only WW1 veteran I had the honour of talking to and listening to. These memories will be abiding and I will always smile when I think of you. You've deserved your rest away from the front line, so sleep well Harry and thank you so much for sharing with me, and many others, some of your memories. I saw Mr Patch in Ypres once. I didn't realise what he represented at the time. My interest in the first world war has since grown and I weep now because of what you were, what you became and what your passing means. You and your friends will never be forgotten by me and I will endeavour to make the pilgrimage as often as I can to where they lay. Good bye and thank you. Rest in peace Harry....you deserve it. Thank you for all you did and all that you stand for. You will never be forgotten. You have kept the fallen alive in our hearts. Now the time has come for you to go and meet up with you mates again, be assured that the place you have won in my heart will always remain yours. Bless you Harry Patch. Sir.... God bless you and good night. The roll call in Heaven is now complete. Goodbye Harry. Without you and the millions that died in world war I you all sacrificed your freedom and our freedom. The battle is over. God bless and rest in peace. I have followed Harry's story for several years now as my Great Uncle Len died in the Ypres area in 1915 and Harry brought me closer to Len. I was with my six year old son when we heard on the radio that Harry had died and he was upset at the news as he has grown up listening to me tell him the history he should know and watching the programs that matter and Harry was part of his education and history. My son James said to me " I'm sad he died, he was a good man and he he taught us not to forget about what happened". Thank you Harry for myself and my son, may you see your lost friends again and be at peace. The nation has lost an icon. Harry, modest and gentle, would never have seen himself as that, but he not only made us all aware of the horrors of World War I, but the futility of it. God bless, Harry. My great regret is that I will be away on holiday next week and unable to make the journey from West Wales to Wells to pay respects to you. From a fellow Bathonian and proud Man of Somerset. Your life story made truly great reading like my grandfather who was in the royal artillery in WW1 he kept his memories and experiences to him self and only in his later years told me of some of them. If it wasn't for soldiers of your generation my generation and my children's generation we would not have had our tomorrow. I remember Harry from my history lessons in year 9 last year when we were studying the great world war and i remember looking down to harry and thinking that he did tremendous things for our country and remembering the one this he said "That war solved nothing"
a land I have not seen. a virgin soldier with a gun. I ask the question why?. given on the day they wed.
why Tommy Atkins ever died. walk in peace across the Somme. a life we had no right to take. And as Harry passes so does the last link to British life in the trenches. I felt so sad when I heard the news. People like Harry are the reason why I became a history teacher and I will do my best to ensure he and others like him are not forgotten. We will remember them. God bless. RIP Harry a true gentleman, my grandfather fought on the Somme and like Harry never spoke of the unspeakable horror suffered by the Tommies. Harry you spoke of that horror and reminded us of the futility of war. God bless you. All is now quiet on the Western Front. We shall not see his like again....much wisdom from a man of true heart. As a history teacher I can say that Harry will never be forgotten. He opened a window into the horrors of trench warfare for my thirteen and fourteen year old students. Through watching programmes such as 'The Last Tommy' and reading his recent biography, we will continue to remember Harry and all those who fought in The Great War. Our annual visit to Ypres with our students will continue to include visits to the Tyne Cot and Langemark war graves, to remember all those who fell. Thank you Harry for your generosity in sharing your memories with us. You have secured them in the hands of future generations. In the words of John McCrae "To you from failing hands we throw the torch; be yours to hold it high." Rest in peace, Harry. Rest in peace, Harry. You gave so much and asked for nothing in return, just like the rest of your comrades, your sacrifices gave us our freedom, god bless you. what a person Harry was , his comment "war is just organised murder" is very true, thanks for all your memories and book. Last November I was one among many who stood in Whitehall, London and watched Bill Stone, Henry Allingham and Harry Patch lay wreaths at the Cenotaph, and now all three are gone and the wreaths laid are for them. Deeply saddened to hear on Saturday of Harry's death, rest in peace dear Harry. Harry Patch, and indeed Henry Allingham who died last week, have in recent years become icons of a generation that most of us only see these days in numerous documentaries on the various history channels on TV. Ours today is a totally different generation with different ideology, but we owe Harry's generation, and indeed the one that followed it in WW2, so much to enable us all to live the way we do today. I went to Ypres a few years ago, you cannot be anything but moved when you go there or anywhere around there, because the whole of Flanders is just a battlefield. The Dixmuide tower museum, near Ypres, is worth a visit to Flanders on its own. My own 2 grandfathers both served in the trenches in WW1, and both died over 30 years ago. I would never have thought then that at least 2 more veterans like Harry & Henry would carry on living into the 2000s and become living standard bearers for the thousands of their comrades who died 90+ years ago. My condolences therefore go ! To Harry's family, friends carers and all who knew him, plus the same to Henry's family & relatives too. God bless both Harry and Henry. As a former member of Toc H I am writing this in honour of you, Harry, and all those who fought in the first world war. Talbot House, Poperinge, near Ypres, was opened in 1915 as a rest house for troops, and was the birthplace of Toc H. Many men such as you passed over its threshold. You were a good man Harry...R.I.P. In your honour Harry R.I.P with love. Though sleep has closed those weary eyes, Let peace be yours with bluer skies. I will always be indebted and grateful to you and your comrades from all nations who fought for our freedom. God speed you Harry patch. To me, Harry Patch was not an 'ordinary' man who is only remarkable because he lived to such an old age and, in doing so, held open the door to our history for longer. He was extraordinary because he had an articulate but uncomplicated and powerful ability to sum up the tragedy, horror, sadness and utter futility of The First World War. To me he did this better than any other veteran. Harry first came to my attention when I saw an interview with him in which he was talking about the shooting of men for desertion if they refused to fight. He said, 'When the whistle blew you had 2 choices. The first was to go over the top and risk being shot by the German's, the other was to refuse and risk being shot by your own side, and you had about 10 seconds to decide which it was going to be'. Those words struck such a cord with me and will stay with me forever, as will the memory of this modest, humble, legend of a man. I think there is a reason Harry was the most well known of the WW1 veterans and I think it was his ability to paint such a vivid picture of his experiences. I hope he is at peace, but I'm grateful that he left his memories and will always be there as a constant reminder of how lucky we are. Four of my great uncles were taken needlessly during this great war, and other souls lost or damaged for the rest of their lives. Harry's story is a reminder lest we forget the sacrifices made and the futility of all wars. Politicians take heed, and let us all honour the memory of one who, although wounded, made a life after such horror, and was a true inspiration and role model to the end. May your God be with you Harry now that you are at peace. Au revoir. A great man and the last of the truly great soldiers who offered their lives for the sake of our freedom!! We must always remember, not only Harry, but all his comrades and this could be done by erecting a statue of Harry on the last plinth in Trafalgar Square. That would be a fitting tribute to all those brave men as well as all members of the services who are willing to give everything for the sake of their Queen and country. RIP Harry et al. It was sad to hear of Harry's passing, albeit after a full life, where he did what most of us do, his best, we will remember him for his quiet strength and his work for reconciliation. Our thoughts go out to his family and friends. God bless and rest in peace. God Bless you Harry, we will never forget you or your comrades. I hope all generations will learn and understand the sacrifice given by so many. Lest we forget. Over the top for the last time Harry, tell the boys we are very proud of what you all did for us. None of you will be forgotten. We salute you. Now gone is That Little Touch Of Harry. We will and MUST remember him! A true inspiration to everyone and a story which will have touched the hearts and minds of people all over the world. The world is becoming a smaller place and it's people like Harry and Henry just a week before him, which gives people like myself and my generation real inspiration and the courage and determination to carry on and achieve better things for our future. I had the privilege of meeting Henry Allingham in Blackpool last year and it is a memory I will carry with me forever. Harry's book was a real inspiration for me and something I will enjoy reading again soon. A true Tommy, rest in peace. We all owe harry patch and the others who have fought in the first world war and other conflicts an enduring debt. In a world obsessed by money and fame the qualities of harry should shine like a beacon to us all. .democracy isn't free it has to be paid for. Some pay with their lives, some pay with their body, and some pay with their mind. Good night and god bless you harry, it's time to rest you have earned it. I cried when I heard that Harry Patch had died. My father was born in 1898 and would have been the same age as Harry if he had lived, but I lost him 52 years ago. He came back from World War 1, age 20 without his legs, but he survived and had a decent job and had me! I wish he had lived as long as Harry so that I could have got to know him better. You've done a good job Harry, reminding us how appalling and heartbreaking and wasteful war is for both sides of the conflict but we will never learn. What a remarkable gentleman Mr Patch was. Did not know him personally but have enjoyed seeing him on the tv, always with a twinkle in his eye. Rest in peace dear Harry. You were the last link to my two grandfathers who fought in and survived WW1. So long Harry, your dignity and wisdom shone through like a beacon. Harry, your humanity and humility will remain alongside your courage and bravery. Your story is remarkable yet as you told it unremarkable. We will never know everything just like my great grandad never told but I hope we learn from what you have told the world. Poppy day is once a year, but we should wear one every day with pride for men like Harry. A simple man who lived a simple life, whose extraordinary contribution alongside those of his generation we shall be forever grateful. So, Harry Patch has gone, the last man standing in the British Isles from that appalling, numbing conflict that was the First World War - now all are present and correct in paradise. When the time comes to stand silent on Armistice Day, remember Harry Patch and what he stood for. That's why we 'remember': this is no glorification of war. Thank you Harry and all your brothers in arms. I enjoyed our time talking together and the quiet way you expressed yourself. I shall miss calling to see you, you were an example to us all, and as I promised you, I did whisper a prayer for the boys when I was in Normandy. God bless you my friend. I read Harry's book a couple of months ago. All I can say is what a man, and what a life. We owe Harry and his comrades such a lot, and I am sure there were many like Harry who did not want to fight, but gave their lives out of duty to their country, family and way of life. Rest in Peace Harry. I completed my dissertation a few months ago for a BA Hons degree - the subject was the First World War and how it changed the men who fought in the trenches - Harry was my inspiration and was never far from my thoughts whilst working on it. He was clearly a gentle, dignified man whose words will continue to inspire future generations and ensure we never forget what these amazing men did for us - I, for one, never will. God Bless you Harry Patch, may you rest in peace, the whole country owes you and your comrades a huge debt of honour for the sacrifices that were made in the first World War. Never Forgotten. When Henry Allingham died last week I was in France, in the pleasant little town of Luchon. I placed a small floral tribute on the local war memorial. Had I been there this week I would have placed one for you Harry. We owe you and yours so much. God bless you Harry and all your mates who never returned. You must not be forgotten. Dear Harry, Thank you. May you rest in peace you lovely man. God bless you Harry, this country owes so much to men like you. We will be forever in your debt. Say thanks from me to the rest of the boys who you now join. Thank you Harry for yours, and your comrades sacrifice's. Wish i had met you. Rest in peace. We have lost a great gentleman. May peace now enfold you. May your journey be blessed and may you now be at peace within yourself. With your words, many who knew little of your war, have now learnt about what should have been the war to end all wars. Hopefully from it, many will learn, war settles little, but causes much heartache. Bless you, Harry, may you now be reunited with all your comrades, and loved ones and have peace and light within and around you. You will not be forgotten, by those close to you and those who have heard your words, because, they touched our hearts. god bless. Dear Harry, You passed away on my daughter's wedding day which is very significant to me as you were my last link to my grandfather who died during World War 1 and fought in France too. Your generation is an inspiration to us all as they had the courage to fight for what they believed in and were prepared to give their lives for it. His daughter, my mother, who is now 92, is a living link between our generations. I also felt an affinity with you, as I work in a Somerset Care Home, and you spent the last years of your life living in one. RIP Harry, you will always be remembered. To a very brave gentleman "Thank you Harry". Lest we forget, thank you Harry (and all your mates) for the world we have now. An inspiration to us all ... to face adversity in all it's forms and to still come back and live a full and long life. My sincere condolences to his family and friends. RIP Mr Patch. Harry gave honest and harrowing reminders to this world of the horror and futility of war. His testament of his lately departed comrades will I hope stand to educate and warn the generations to come. Thanks for sharing harry rip. Dear Harry, may you rest in peace with all of your fellow comrades. Although I never had the honour of meeting you, I've read many things about you and seen you on many documentaries. It is a sad feeling knowing that you are the last of the surviving soldiers from the western front. History is going on. The past is warning us, what was possible in the past, when we are looking in the present and the future. Against the background of the past/history, we might see, what might be possible in our time. History, the past, won´t recur as it was, but the challenges in the present and future are the same, since the history of manhood started some millions of years ago. Perhaps we are learning from the history - perhaps. History is going on. Farewell Harry and thank you. Men like you have meant that I haven't had to go to war. I never knew you but tears flow freely from my eyes as I type this less than adequate message. R.I.P. A sad time for all in This Country during the last few days with the passing of Harry Patch. As someone who is now over sixty five, I can remember my parents instilling in me the importance of Remembrance day from very early days. I have done the same to my sons. My youngest is eight next month, and last November he came with me to a local supermarket holding the tin to collect money for The Poppy Appeal. As a once Royal Marine, that made me feel very proud. Only last week I paid a visit to the Royal Marine museum in Eastney. There again the sacrifice of those horrendous days was played out. The legacy that Harry Patch will leave is the awareness that he has given to the waste of life in war. For the service he has given, and the service he will continue to give should be by a posthumous Knighthood. Rest In Peace Harry. I'm not sure about the suggestion of a State Funeral, according to what we know about him, he was a private, quiet man and I think his wishes should be carried out as to what sort of funeral he wanted, and not what the country thinks he should have. I would like to see a statue of Harry located perhaps somewhere in Wells where he spent his last years, and some other 'In Memorium' to Harry to celebrate such a special man and his achievements. R.I.P Harry thank you for what you did for us we will always be in your debt god bless you harry. RIP Harry, & thank you. Rest in Peace Harry - What changes in the world you saw, what horrors, the best and the worst of mankind. The last link to the bravest of the Generations. Your words, thoughts and deeds must never be forgotten. Forever grateful for all the sacrifice from all those who gave everything for us. How incredibly profound your insight was into the folly of war; Harry Patch: how easy it is for politicians and the military chiefs to condone it from behind their desks. I will not forget you. Rest in peace. Rest in peace Harry, and thank you for your eternal message you bravely revealed to us through living the horrors of WW1. You and your testimony are a precious gift to all of us, I accept your message with all my heart and you will be missed. God bless you Harry, a true soldier and gentleman. Thank you Mr Patch; you and your comrades in both world wars gave, so that we can live in freedom today...we must not and will not forget. A credit to the human race. God Bless you and all of the fallen. Farewell to the last Tommy. Thanks for your memories and what you had to say. Gone but not forgotten. Harry you may have left us but the history you brought to the notice of young children and those of us just a little too young to remember WW1 will live on. Your book 'The Last Fighthing Tommy' sits on my book shelf ready to be taken down and re-read many times. May you be reunited with those you had lost and may you now rest in peace. I grew up with the memory of the Great War embedded firmly in my mind. My father fought with the Rifle Brigade in that War and his only brother, a Coldstream Guardsman, was killed in February 1915 aged 21 years. I am saddened that Harry Patch has died; the Great War has now passed from living memory into history. I have been a member of the Western Front Association for many years. I visited Passchendaele, where Harry fought, this April on a Battlefields Tour with my cousin, Margaret, and have read of the terrible conditions that obtained in the prosecution of this horrific battle. Rest in peace, Harry; we shall never see the like of your generation again in the future. You have been worthy of the title "The Last of the Fighting Tommies"! You were the same age as my great uncle Edward Coultas who was killed at Passcendaele on 4th October 1917. Be assured that your generation will always be remembered - I feel that humankind here in the 21st century will take up the torch and work towards caring for our beautiful planet and restoring and mending all that we have greedily taken and broken. Every blessing to you Harry Patch. Dear Harry, how much has happened in your lifetime! wars/titanic/etc you lived through all these events it seems like a part of history has now left us forever,RIP you have now joined the millions who fought and died in the great war, your book should be made compulsory reading in all secondary schools and im sure it would make some children grow up into better people and not into the yobs we have roaming the streets today, i bet you despaired at some of todays youth when you compare them to the people you fought alongside with. A recent trip to brugge,flanders,the trenches and the cemeteries, was without doubt the most moving, thought provoking experiences we have ever had. Nothing can ever prepare you for the cemeteries and the volume of mass graves. I watched a programme last night on the "Tommy's" God bless each and every one of those men and women who gave their lives so we have our freedom today. We are forever in their debt. We have put together an album of our visit a tribute to share with our family. Rest in peace Harry and all who fought with you to give us all we have today god bless you all. This man should never be forgotten, they gave us our freedom, Never forget them. Don't call him a great soldier, please. He was a man of peace. Like my grandfather, who was also called Harry, he was most unwillingly forced into the Great War and decided, with his friends, that he would not kill anybody if he could help it. I honour and grieve for him and wish we would all listen to what he said: war is organised murder. R.I.P Harry. You are reunited with your family and comrades now, you were a true inspiration to us all, Thank you Harry, you and your comrades will never be forgotten. Thank you, Mr Patch, for your sacrifices that allows future generations to live in the way that we so often take for granted. He was a gentleman in every sense of the word.hopefully now he will be at peace. God bless you Harry Patch. In gratitude and memory of all those fallen in the Great War. A gentle Hero, the nation salutes you, may you rest in peace with your pals, & the lads who never came home. Harry Patch should make everyone Proud to be British. He has made sure that we will never forget the brave people who have given their lives for us. With the roar of distant thunder a flash of blinding light a rain of steel hailstones comes from somwhere out of sight the lads they foraged onwards across the battlefield to lay there in their thousands on Flanders bloody fields. Dulce et decorum est pro partai mori. God bless you Harry Patch, we will remember you. What a fantastic ambassador for Great Britain. He went to hell and back serving his country. I admire him. Rest in peace. Each November Harry Patch and other comrades would remember the horrors of WW1 and their fallen colleagues - that is a life sentence - though I doubt a single day went by that they didn't remember. Their humility and dignity never cease to amaze. Those who know little of WW1 should read 'Birdsong' by Sebastian Foulkes, although fiction it brings to life the horrors and immense sadness of war. I'm sure there are many Harry Patches today out in Afghanistan and latterly Iraq. God bless you Harry Patch and Co. - we MUST NEVER FORGET and yes, your statue should be standing tall and proud. If this Government can't supply our serving troops with all they need then at least do this. Harry, The "The Last Tommey " I salute you for your courage and dignity, goodnight old soldier, rest in peace at last with your fallen comrades God Bless you all. And so the final platoon is gone now. Fare thee well, Last Tommy; I raised my glass up high for You. In trying to write about someone who has lived, at least in part, in three separate centuries, words immediately seem somewhat inadequate. In saluting Harry, and of course the late Henry Allingham, we are acknowledging the awesome sacrifice made by what is now a lost generation of supermen. The late Harry Patch was the very last ambassador of that great cohort of dignified and stoical heroes, our final, physical link to a band of brothers to whom we owe everything and who lived, and often died, in a world that now seems a thousand years away. Whatever one's deity, or otherwise, and with daily news of yet more tragic deaths in Afghanistan, we, as a people, must give thanks for the life of all our country's Harry Patches, alive and dead. For it is they who have made our comfortable, modern, well-lived lives possible and goodness only knows where we would be without them. Therefore, in remembering all our brave heroes, I say, in all humility and gratitude, 'thank you, Mr Patch, thank you for my safe and comfortable life'. A sad, sad day. My Grandfather Stanley Tupman survived The Somme and used to tell me of his time there, i now treasure his letters he'd written back home then. Harry Patch you were the last of a truly unique generation and it is the responsibility of our generation to ensure you and your sacrifices and honourable bravery are not forgotten. Thank-you to you and others like you so we can live in a country of freedom,god bless you all and lest we forget. This gentleman was my hero,not the footballers or the film stars. people mainly the young forget or dont realise what these people did for us all those years ago and the debt we owe them which we can never repay. I freely admit that i shed a tear or two when i heard the sad news of Harry's passing. I would like to start a campaign....how about a National Funeral for Harry Patch?? As he is the last British survivor of WW1 does he not deserve some national recognition for all time? A national funeral attended by veterans, politicians and Royal Families from Britain and Belgium along with a national monument to allow people to pay their respects. I seem to remember that America gave a national funeral for the last survivor of their civil war so why can't we do similar?? Only a suggestion but what do people think?? RIP Harry. You said that disputes should be settled over the table not by war. You were of course right. Perhaps it is about time politicians took heed of your sound advice. WW1 is a very emotional topic. My grandfather died in France July 1917, aged 31. The war should never have happened. Harry was correct when he spoke of legalised murder by all sides. R.I.P. Harry Patch. So sad at Harry's passing. What a lovely man, a true gent. Rest in peace Harry, you deserve your rest now. You were a wise and dignified Christian man Mr. Patch, hopefully you have now found peace in the company of those that you once cherished. God Bless. A very sad day, But also a happy one, Harry is finally reunited with his old comrades, The last of an era in our history that must never be allowed to be forgotten. R.I.P. Harry, your torment is finally over. What a pity our politicians never listen to people like you Harry, the world would be a happier place, it will be much sadder with your passing. A lot of people in Bristol will remember your work in the city. Thank you Sir. Too young to know the full horrors of any war but so proud to be a beneficiary of all Harry & his comrades fought for - freedom. I know he and all of his friends don't see themselves as such but trust me, they were ALL HEROES to us all. Thank you from my heart for your strength, dignity and courage, not just then but throughout your life. May you continue to be an inspiration to us all. Gone, but never forgotten. Rest In Peace, Mr. Patch. This is a poignant moment in British history, made all the more so by destiny making our last Great War veteran such a remarkable man as Harry Patch. This was a man who didn't want the war but followed his duty in good faith. Who comforted the dying Cornish soldier as his mother came back to help him over to the afterlife. Who didn't think the war worth a single life and so only shot German soldiers in the leg, regardless of whatever his officers might have thought of that. Who at an age most of us won't reach summons the exceptional courage to talk about his experiences- not just once for the record but many times to audiences of all backgounds and generations- so that we really would know exactly what it was like. His television interviews were remarkable:- you hung on every intense, resonant word. My grandfathers were Great War veterans, like all my generation's grandfathers. And now they're all gone. Harry Patch always said he accepted the public acclaim on behalf of his fallen comrades, and they couldn't have wished for a better standard bearer. I hope there is a big public memorial built for him. Harry Patch was a truly Great Briton. What an example to us all, god bless you Harry you will stay in our memories RIP. God bless you Harry. Thank you for what you did. Thank you Harry. You and your generation will never be forgotten for your courage and sacrifice which symbolised our nation and gave us our freedom. Thank you. I feel really sad that you have passed away, Harry. Just thinking what it must have been like to live through and witness ALL of the 20th century is awe inspiring, even though it wasn't always, least for you, a time of roses. Your war memories and stories touched me deeply and, as a Historian, it was an honor to be able to "glimpse" the past through your eyes. I always felt the most deepest respect for you as a veteran and you seemed to me a true gentleman. You will now be reunited with your family, and also with those three best friends you lost so many years ago. Reunited with loved ones and fellow tommies there is one hell of a party in heaven today. RIP Harry,I hope that the modern generation learn about you, your sacrifies with your comrades, and your faith that war solves nothing. My son took part in a play about Harry Patch when he was young and in the war. An experience that he will never forget. I went to the performance on the evening that Harry attended and it was all very moving. Since then I have always taken an interest in news about Harry. My condolences go out to his family. I was watching The Last Tommy programme re-runs today and then my daughter rang to tell me that the oldest survivor of WW1 had died. I said "not Harry Patch" and she wondered how I knew his name so quickly. "I am just now watching him on the TV I said". How sad that henry allingham and harry patch passed away in the same week.i think a state funeral is in order as respect for these remarkable men.goodbye harry. God bless you Harry....Thank you for the sacrifices you and your comrades made for me and all of us.We are forever in your debt. Rest in peace, Harry. You were the last of an unforgettable generation. May we never forget the sacrifices you and your comrades made. Take care mate. You'll be greatly missed by the world. At the going down of the sun, we will remember you. Thank you Harry for being there to remind us just what we owe to you and your generation. It is now our responsibility never to forget. I was very sad to hear of the death of Harry and, although only knowing him and of his heroics through countless stories and television documentaries he, to me, symbolised the spirit, courage and determination that I associated with the British troops during World War 1. May you now rest in peace Harry as you rejoin your former comrades. Thank you for all you did for this country. May saints and angels watch over you. Rest in peace Harry. I never met you but would have loved to, after reading The Last Fighting Tommy. You were inspirational. I wish you, Henry Allingham and Bill Stone had been given more recognition, maybe even a Knighthood or OBE, just some small measure of the thanks this Country have for what you all did. I feel really sad hearing of your passing, but wish you eternal peace with your loving family and friends. God Bless you Harry, rest in peace, we will never forget you. Thanks for what you did & were, Harry. We will endeavour to raise our children using you as an example of respect, honour & compassion. I did not know you Harry but have read and listened to the news. Thank you for all you and your conrades did all those years ago to enable us to have the freedom we so take for granted. Rest in peace Harry and God bless you. r.i.p. harry patch,for evil to prevail good men simply have to do nothing. i hope my childrens eyes never have to see what yours saw. thank you harry for the freedom you fought for as we are the people who have benifited from your sacrifice and without you i would not be please look after this special man my thoughts are with you and your family rest in peace you earned your place. The likes of Harry Patch we will never see again. I am so saddened at his lost but at the same time I feel so privlaged to have been allowed into Harry's world through his wonderful stories broadcast on radio and television. I will never forget him and when I remember my Great Grandfather and Grandfather killed in WW1 and WW2 I will save a place for Harry along with all the other service men and women past and present. It was right that Harry should be the Last Fighting Tommy, his humanity shined through, it was as if he was the chosen spokeperson for the soldier of the Great War to close the final chapter of the book before it went into history for ever. When Harry spoke you felt he was talking on behalf of your family member in WW1 so it made it feel very personal and yet he probably never knew he had that impact, he was just telling the story how it was. To be able to touch people lifes without knowing them is a rare gift indeed. Very few people in the world have that gift and for those that do the word "Great" is often used in their company and I for one will always see Harry Patch as one of the true Great's. May he rest in peace. You are a legend, hope we never forget you . Good night brave soldier & if its true you can now be reunited with your brave friends. I will always remember this wonderful gentleman. Words alone cannot due justice to Harry and what he stood for. May he rest in peace. God bless you, Harry. God bless you. A true hero. RIP Harry. I will forever be in debt to the sacrifices that you and your generation made. I have "The Last Tommy" book and I enjoy it. You can now join your mates who died on Saturday, Septemebr 22, 1917. I will never forget you. Notable deaths in the media do not normally bother me, but then from reading Harry's book Harry was not a normal man! His book is an amazing and humbling read, a read I would recommend to anyone, makes you put your own life in perspective! Thanks to Harry and millions like him people of today will never have to experience such hardship! A sad day, a sad loss, to a man we all owe so much! while you kept going the whole world was not allowed to forget the sacrifice given by you and all the fine young men.you visited many schools and hope that the next generation will grow up with a better attitude, thanks to you. my picture of you still hangs, so as to remind me of you. RIP Harry, we will remember you and your generation. Thank you Harry and all your comrades who fought during the First War, including my grandfather. We will, I hope , never forget you. I have visited the Western Front battlefields, including the Somme, and even after all these years the places still have the power to move one. We cannot now really imagine what you went through. I shall never forget the sight of the three gentlemen attending the Cenotaph last year. May you all rest in peace. Harry, you're a great man you'll never be forgotten I cannot say hw much I appreciate what you and your comrades did for your country those 90 years ago I've been to Ypres and Paschedale. I'll never forget you!! Harry you are a true hero and gentlemen. If there is a state funeral to remember u and ur generation then I will surely attend. As a member of the British Public i salute and thank u and ur generation on our behalf. Rest in Peace. It was very moving to read Major John Macrae's poem inscribed on a plaque outside a former Dressing Station near Ypres during a visit to Passendale two years ago. It's impossible to imagine the full horror of what Harry Patch and thousands of his fellows had to face. God bless you Harry; you were an inspiration to all. Nos da, Harry. Diolch o'r galon. Thank you, Harry. Thank You. A very sad day, with Harry Patch's passing a window on history closes and the lessons he hoped humanity would learn, that of to not make war, are and will again be ignored. A great man, a symbol of a generation who offered their lives without question for their country. We should have a national day in his honour to keep alive the opposition to the folly of war. We will be raising many an ale to celebrate his life and wisdom across the land. Harry was the oldest surviving Firefighter from WW2, and this was the link which enabled me to get to know this grand gentleman. Harry made me feel very special on my several visits to Fletcher House, We were able to talk about things other than WW1, including Wales and Shropshire, where he lived for a while after marrying his first wife Ada. It was not possible to bring Harry back to visit Shropshire, but I was privileged to facilitate the presentation of a painting of a Shropshire landmark to him last year, as well as helping to organise the presentation of his Defence Medal last September at Bath Fire Station. Harry in return presented me with my BFSA 20yrs Silver medal only two months ago. My memories (and photos of him) will last for ever. Are you the greatest man that Britain ever had? Maybe not, but pretty damm close! You were the voice of Scotland, England, Wales and Ireland from 1914 til 2009! I've been to Ypres, The Somme and Passchendaele. I'll never forget you , my heart is breaking today! My wee Lamb , rest in peace , you deserve it. WE WILL NEVER FORGET! Rest in the Peace you fought for. I wish we had learned more from your experiences. We will remember you. Rest in Peace. God bless you, Harry Patch. The last of a truly golden generation. A sad day. Although I never met Harry I felt he was the last link to my great uncle Corporal Frank Hawkins of the Royal Garrison Artillery who died on 12 September 1917 at the third battle of Ypres and also to my grandfather, who survived the Somme. I hear you, but cannot answer you. It feels as if I don't know you, but I do; You reach and answer me, I see and hear your soul, The soul of a people, Of time and times, Of good, And all. A sad day. Although I never met Harry I felt he was the last link to my great uncle Corporal Frank Hawkins of the Royal Garrison Artillery who died on 12 September 1917 during the third battle for Ypres and also to my grandfather who survived the Somme. You were the subject of our Year 5 Remembrance Day assembly last year. The school was moved by your story and your words. Many 9, 10 and 11 year old children will never forget. We were so lucky to meet with Harry earlier this year at his nursing home in Wells, Somerset; where he graciously recorded the famous extracts from the Binyan poem "For The Fallen", for the title track of our album. When we recorded Harry's voice, we later remarked that it was almost was like a photgraph that had faded with age- not much more than a whisper, however, being in the same room with this amazing old gentleman, as he delivered the very poignant words, that underlined the true horror of the senseless slaughter of a generation, is an experience that we shall both carry with us for a long time. A very humbling experience indeed.With his passing, so a door closes on an entire generation of men that took part in "the war to end all wars. "Thank you Harry.Our words are truly not enough. RIP. Harry grew old so that we could be reminded of the horror of war. His dignity and gentleness have been an inspiration we must never forget the sacrifice of his generation, God bless Harry, all his comrades and adversaries. How can we thank you sufficiently, how can we let you know we appreciate what you and your comrades did for us. We havn`t yet shown you all, perhaps we will find the guts you all showed to speak up for what you and your wonderful generation can not, you must all be so ashamed of us who do not speak up for the loss of the country you all laid down your life for. God give us the strength to get you all the rewards you deserve in death that you were never given in life. You asked why they all died once we thought we knew but not any more. What you wonderful lads died for has long gone. God bless you Harry Rest in Peace. For Harry and all the brave men and women in WW1. Farewell Harry. You are our hero to be never forgotten. Go where other soldiers rest, and watch over our lads in conflict. Rest in peace Harry. We owe our freedom to you and your brave comrades. Thank you from a generation that takes it all for granted. After watching the documentary and being touched by Harry's words a couple of weeks later I found out that he had worked with my late Father making Torpedoes at Whitheads during WW2. I was pleased I could meet with Harry and he told me stories of my Father.They Made kettles etc from left over materials and I still have a Sand bucket that my Father made.Harry insisted in having his photo taken with my Sand Buckett and I treasure the short time I spent with him.Rest in Peace Harry. Thank you, Harry Patch, as I would like to thank everyone who has ever fought for our freedoms - I think your statue should stand in Trafalgar Square. A very sad day the loss of one of natures Gentlemen. It is a shame that Harry was never honoured (for all he has done not only in the great war but in later years for us all) by his country which I believe he gave his whole being to God bless you Harry Rest In Peace You are still a true Gentleman. Trevor & Gillian Llewellyn, Almondsbury, South Gloucestershire. I never thought I would be writing another memorium within 1 week and it is with great sadness that I find I am doing so. After Henry Allingham passes into history so to does Harry Patch, the last fighting Tommy and our last link with a horrific World War that saw so many lives wasted by generals fighting a modern war with archaic methods. Harry Patch was born in a small village (Coombe Down) in Dorset in a period that one imagines was of peace and quietude but within a few simple years that humble lifestyle was about to be shattered by the thundering drums of war. Harry did not want to join up - he would have preferred to have helped his father sustain the family business in the building and carpentry trade but like many of his comrades before him he felt compelled to join the battle overseas after receiving his call up. He wouldn't shirk his duty either and on being thrown into the battle of the Ypres he valiantly gave his all, losing three of his best mates in that battle, he himself injured so severely that it was thought he would not survive. He did, and for a further 90 odd years to boot. Having recently read his fascinating book - The Last Tommy - I felt so much more closer to him and feel his loss. But I also see that he would not want the world to mourn his loss but to regale his comrades and remember them. Politicians only now stand to their feet in paying homage but they should remember that today's heroes are still young and have their whole lives ahead of them. They currently face a huge lack of support from their government and, in some quarters, back home! Yesterday, I had the privelledge to show my support to a few, rather humble marines and ex-servicemen as I do every year in November. Don't let the Henry Allingham's, Bill Stone's and Harry Patch's of tomorrow be forgotten until their final years and days - remember them now. And the next time you put an ex in the box for a party that shows no support for its troops you become indirectly responsible for clapping your hands when it is too late. It galls me to hear/see politicians attempting to secure public opinion and to think they will turn a great man's funeral into a media circus and huge public showing of grief which, if anyone has read his book, or even listened to Harry over the years, they will know that this was not what he would have wanted or was about. I will shed a tear in my own way for Harry Patch as I am sure many, many more will. Yet it is always the common man or woman who stands valiantly to fight for these very men in battle. Harry Patch - a true legend among legends. Like Henry and Bill Stone before you, you have earned your long awaited rest and are now with your comrades and family who shall take better care of you than we did over time. God bless you, Harry - R.I.P. God bless Harry, rest in peace alongside the many other British Heroe's of WW1.I watched you only today on the History Chanell.Hope your reunion with your old pals goes well.G'night mate, I will never forget the sacrifice you and your mates gave in order for this generation to live the lives we live. I never had the pleasure of meeting Harry Patch but I have read "The last tommy". He came across as a truely remarkable man who spoke a lot of sense concerning war. I am truely grateful for the sacrifices that he and his comrades made for my freedom.My two young children have always been aware of both world wars and the sacrifices men and women made for our freedom today. May you rest in peace with God,your fellow commrades and family. Thank You Harry Patch. Harry, me and my family wil be in debited to you and your comrades, and all soldiers sailors and air men that fought in the great war and ww2, for ever RIP Harry. As a student of history, I have read much about the futilities of war, particularly in the 20th century. Men like Harry sacrificed much to give us the freedom that we often take for granted, this should always be remembered with the utmost respect. I've had relatives that fought at Kokoda, North Africa, Vietnam and in the trenches of Western Europe, and they all experienced things that no-one should ever have to endure. I salute your long life Harry and all its achievements, may you forever Rest In Peace. At least you can now be reunited with your family and mates. REST IN PEACE, Harry, The Last Tommy,of an army of heroes, in a documentary Harry said he came across a cornishman, ripped from shoulder to groin,(shrapnel) who begged him to shoot him, he died in front of Harry, saying 'Mother'. Harry said ever since he knew that death was not the end, so Harry tho i mourn your passing,i hope you've found a new beginning. A statue of a true Gent would be fitting in Trafalgar Square on its 4th pillar.....but can we trust this Govt. to really honour its dead. God's speed Harry, and thanks to all U.K. vets over the years. Michael Scott Howard, Cleveland, Ohio, U.S.A.
A man of integrity and humility. Sleep now in peace. The tragedy is that many more will follow. Thank you. Harry knew the madness and futility of war personally. May his death serve as a reminder that peace is the only sane option in this world. Rest in peace, dear brother, we shall never forget you. Thanks for allowing us the generation of today to listen to what we thought of as history - and which was life to you - so as we can understand the lessons for the future. Obviously I knew nothing of this fine gentleman until a few moments ago. A very impressive man to say the very least. I'm very sorry for your loss. He must be quite a national treasure for you. recall, if you prefer - but learn? The Cenotaph - a memorial for what? they gave their lives for their country, fought for democracy, died for king and empire, lost their lives defending the faith. went simply to join the battle. will not need to be told to remember. "We killed and got killed, and since then nothing has changed." Harry - You will have your 'quiet' funeral in front of the millions who loved and respected everything you stood for. Your memory and your final words are to be respected. "War is such a waste of young lives." Harry Patch may you R.I.P. together with your comrades taken so quickly from you. The world owes you oh so much. Peace is acheived by so much waste of life this you and your comrades gave to us. We can't thank you enough. To your family and friends our heartfelt wishes on your passing. WE WILL REMEMBER YOU. In August we will be in France Belgium with the National ex P.O.W. association North East branch the A.T.S. Association (now W.R.A.C.) and members of the war widows association Newcastle, my mother and brother will be visiting Dunkirk memorial where my fathers ashes' were returned to be with his mates. On the Tuesday we will be laying wreaths at the Mennin gate Ypres for the Royal Engineers, Black Watch Tyneside Scottish, EX P.O.W. & the A.T.S.- our thoughts will be with HARRY the last Tommy and his mates and of course Harry's family this will be our last visit as a group it is always a difficult time but now that HARRY has gone it will be very upsetting for us all. R.I.P. You are a Legend to all of us. This is a sad day. God Bless you. I have no words to say how I feel about Harry and all of the honourable dead, whether their God called them home during or after conflict. We should have a State Funeral for Harry in order to honour all of those who died, both friend and "enemy" - Harry and his comrades had compassion for the young men on the opposite side of the trenches too. We must remember what they and the hundreds of thousands of military and civilian people died for and never let it happen again. We should lobby the Queen and the Government for a State Funeral, not just to honour Harry but to show respect for the beliefs of Harry, Henry Allingham, and the numerous unnamed who passed by this way to keep us free and to show that we should talk, not fight. Oh how England needs real men of your calibre now, rest in peace with your heroic comrades. God bless you Harry. I wish I could have met you. Thank you for everything you did for us all, my children owe a debt of gratitude to you and your generation. I will teach them about the bravery of a bygone age and will make sure they remember your name. I only hope we can live a life so full. Very sad sitting at work reading the news at lunch of Harry's death. I am 40 and as a child I was aware of World War I as my Grandfather was in the Navy and had lost a friend in the trenches. I have his dead man's penny and Christmas box. In later life Harry was able to put a face to the ordinary man who served in that terrible time. I have read his book several times and if anything is a tribute to Harry it has been the ability to instill in me and I hope others, the sheer stupidity and waste of life that was the First World War. Also though the bravery of those people and more importantly we should not forget their sacrifice and pass that message down the generations as will one day to my children. Thank you Harry. Thank you Harry. Veterans don't die, they just fade away. Rest in Peace. Brave beyond words, modest and a true gent. A national treasure! Sleep well Harry. It saddens me that despite the massive sacrifices of yourself and your comrades, we still have troops dying at war today. Despite your words of wisdom, despite common sense and despite the years of reflection upon the waste of decent young men... men and women are today still ordered to take up arms and engage in mortal combat in the name of world peace. God bless you Harry, god bless your fallen comrades and god bless the soldiers that are falling in today's troubles. Yours is now a world without suffering, a world of peace. We shall never forget. In this fast busy world we are often preoccupied with the now without time or appreciation for those that have seen so much more than just today. My imagination can not begin to capture the range and intensity of sights, experiences and accompanying emotions that you sir will have witnessed. But I can give the space to reflect in awe, respect and wonderment to you Harry and the uniqueness of your life. Thank you. Our RAFA standard will be dipped in your memory. Rest in peace. Thank you for your sacrifice - i hope that your family and friends will allow your country to show one last act of respect to you and your comrades with a state military funeral. I had the wonderful opportunity and great pleasure of meeting harry earlier this year and although he was a little frail he was in high spirits and enjoyed his egg and chips at the rose and crown pub which he reopened in 2007. Harry will be missed, certainly by me and millions of others too as harry was the last fighting tommy and always will be. RIP Harry Patch. We narrowly missed meeting you in person in an Ypres bookshop a few years ago, where we found the Zillebeke grave of my husband's great uncle Reg, who died in his tank, aged 23, in July 1917, shortly before 3rd Ypres in which you lost your pal. We knew of you from the BBC Veterans series and have followed news of you ever since, humbled by your dignity, stoicism and courage. At least Richard Van Emden signed his biography of you for us on your behalf, and we'll treasure it. Although you and Henry Allingham have finally gone to your rest, we must never forget the folly and waste of war, (how ironic that the announcement of your death on the BBC Radio Four lunchtime news was immediately followed by the noting of another young death in Afghanistan) that you had the perfect right to decry. RIP Harry Patch, Last fighting Tommy, noble and justified pacifist. MR Patch sir, Thank you for your service and for the freedoms for which we enjoy today. Men of your calibre are hard to come by. Rest in peace. A sad day. R.I.P Harry, God Bless. RIP united with all who went before. It's a teary eyed lump in the throat day for the second time in a week, the solemn dignity of these men, never to be forgotten, my daughter (5 yrs) watched both yourself & Henry in your final months, wreath laying on Remembrance Day, she understands to a degree already as to your courage. We will be taking her to the battlefields & Menin gate to further her understanding & pay our respect to the fallen. Thank you Harry, thank you so very much for all you have given. I can't begin to imagine the awfulness of what you and your peers experienced, but salute you all (while not condoning the terrible sacrifice) and will remember your name to remind me always of the staggering conditions and loss of WW1. I am sorry for yor death, and hope there is a better place. Very sad to hear of Harry's passing, a good and decent soul. On recently visiting Ypres to see Hill 60 where my grandfather disappeared into the mud on 1st March 1916, nothing can prepare you for the overwhelming sense of loss as cemetery after cemetery proclaims the futility of industrial war. Walking around the cemetery at Tynecot and its wonderful museum, cannot fail to bring a lump to the throat, row after row of sons, brothers, husbands and fathers broken only by the graves of the unknown. On a visit to a small cemetery on the Bluff which only contained 51 graves of the Duke of Cornwalls Light Infantry which I was later to find out was the regiment of Harry Patch, it brought home the human cost to individual communities across the country and the suffering of their families. Soon the voices of World War One will fall silent and it will become the realm of the historian, but the words of Harry Patch and Henry Allingham and all the others will remain a testament to their acts and deeds. Good luck Harry and Thank you. Rest at last, with your friends from Passchendaele. God bless you Harry. We owe you and all the others our freedom. Rest in peace. Thank you. Sleep peacefully Harry. You were the last Tommy and I hope both you and Henry Allington get the full public and military funerals that you and your fallen comrades deserve. Truly the last of your generation who will never be forgotten. God Rest Harry. I saw you for the first time on a documentary. I thought you were a great talker and I appreciated what you went through for us. Lets hope it was not all in vain. Like you said.. talking should come first in any disagreement. God Bless you Harry, we will never forget. Here is a man who, like many of his peers, gave unselfishly, because it was the right thing to do - regardless of religion or fear for personal safety. I hope I can share some the lessons from Harry's life with my sons in a way which has meaning for them and inspires courage and gratitude. I don't have any memories of Harry, but my Grandfather Robert McSorley was also in Ypres between June 1917 and August 1917. These were the dates that he was awarded his MM and DCM Medals. Granddad survived the war and lived until 1966 at the age of 74 he passed away. I am extremely proud of my Grandfather and ALL of his comrades that fought in this and other battles. My Grandfather was part of the Battalion that blew up the underground tunnels that the Germans had dug. God Bless Harry and all the other Granddads who did so much. As a History teacher who uses Harry's autobiography and clips of him speaking in 'The Last Tommy' series to teach about WW1, I can say that my pupils will be saddened to hear of his passing, but will forever remember his accounts of the trenches. The nation mourns, may your memory live on, you deserve a state funeral. On behalf of all the members of The Great War forum, I would like to add our condolences to Harry's family & friends. Harry, as all WW1 veterans, have been a great inspiration to us all. He will be greatly missed by everyone he met and touched through radio & television. RIP Harry. Dear Harry, Forty years ago as a young chap of 24, I lived in London SW11 and had a beautiful, French blonde girlfriend from Lille. I had a Michelin book on the battlefields of WW1 and went over to see her one holiday in 1970. She was an assistant teacher in London. I showed her a photo in the book, of the Cloth Hall in Ypres. It was a pile of rubble - totally demolished by artillery. She was puzzled and said: "I don't understand. We go to Ypres for ice-cream, and the hall looks quite normal". We drove there and yes, it was. We entered respectfully and an elderly guide took us up to the Burgomaster's Office, where there was a Toc H lamp on the desk. He explained that the hall was destroyed but the citizens re-built it stone by stone, using plans and pictures from before the war, so that eventually it was put back into condition. We looked at the names all over the Menin Gate, and the Last Post was sounded at 6 pm. I thought of the troops of the B.E.F. like you, who risked or gave their lives. Thank you Harry. I will never forget. The Michelin book belonged to my grand- father, who would not kill people. He served as an ambulance driver in the war. Three cheers for harry. You opitimise all that is good about the human spirit. A peaceful man who did his DUTY in desperate times. I would like to see a statue of you in Westminster. DIGNITY maketh the man. You are an admirable human being. I am certain that your friends will be waiting for you in your next world. You give direction for those of us whose wars are a mere 40 years behind us, or even more recent. My son was brought up in the Sudbury area in England. He visited me last month, it is my turn to go over there to visit him. He is also a veteran of two current wars. Thank you Mr. Patch for your service and your strength to keep moving forward. I'm sure that GOD has a special place for you next to him. Thank You! Johnny B.Nicholas, Richwood, West Virginia,U.S.A. At age 16, the gentleman I worked for, I think saw something of himself in me, gave me his bayonet that he used in the trenches with the AEF. He simply said it has seen a lot, please take care of it for him. At the time I didn't quite know what to make of it. My father who fought in WWII said that it takes time to understand some things in life. I fought with the Marines in Vietnam, and now at age 65 I still have that treasured bayonet, and I'm beginning to think I understand. Thank you for your service and your sacrifices and God bless you. It is typical of Harry's modesty and pride in his real career, that he would like to be remembered as a plumber and sanitary engineer, rather than a soldier. But armies have memories, far longer than the memories of anyone in them. The mistakes of the First World War are a major reason why "Let's just make a frontal attack" is less liable to get a hearing in the British Army than most others, even today. We can handle the plumbing alone, most of the time. But it is as a voice on war, in an age when small professional armies make it far easier for nations to go to war when they could have got out of it, that Harry has become a priceless national asset. He deserves the deepest admiration and the best of care. But we need him more than he needs us. I want to pay homage to Harry Patch and all his fellow countrymen who fought for our freedom.No words can say enough gratitude to these heroes. I've decided to write my GCSE English Coursework on this man as he is such an inspiration. The bravery and courage he has shown is amazing, the way he shows mercy and compassion even when confronted with an armed German is awesome. Harry you are simply a hero and an inspiration to us all - god bless you. Your generation paid the price for us to live as we do today, giving us all a freedom we seldom enough think about - Thank you and your chums. A word to sum up Harry. Dignity. I think that does it. A credit to humankind. Old soldiers never die, they keep living in our hearts. Thank you you made us feel so proud of our fellow man in these days of deceit dishonour and deception. Wonderful words stay out of arguments, clean living, good thoughts and such a good hearted person. Maybe it should be Sir Harry Patch, but reading about you, nothing could improve your person more than you have already proven. God bless you. Harry sounds a remarkable man, i understand when he says about killing someone he doesn't know. Lest we forget. God Bless you harry. Dear Mr Patch, As an American and a student of history, I would like to thank you for the sacrifice both you and your generation made.Though I cannot physically shake your hand or utter my thank you in person, please know that the heroism and honor of the your generation will never be forgotten. Mr. Patch I raise my glass to you. I am 14 years young and I have the utmost respect for Mr Patch for his stoic heroism in WW1 and for his contribution to life through his Christian beliefs. Long live Harry. As a 17 year old girl studying History and hoping to do the subject at Oxford university I have been well and truly dumbstruck by Harry's story. It has had an absolutely inspirational effect on my life. I want to thank Harry for breaking his silence and being such an unsung hero of our world today. He really is a remarkable man who commands greatest respect and we can all learn from. Thank you Harry. This man is one of the greatest men to ever grace our land, if all the people of the world were more like him then the world would be a safer place. he is the embodiment of what many people think of tommy's in the first world war. just an ordinary lad caught up in extraordinary events. the nation owes you a huge debt and should show its appreciation on your death. I will be forever in your debt for the sacrifices you and your fellow comrades made, and for everything you did in the name of freedom. Your story has touched me very much, Harry. I don't suppose you ever expected to be a TV star, but the things you have said and the experiences you have related are of great importance to us all. The funeral of Harry Patch took place at Wells Cathedral. Thousands turned out to pay their final respects to Harry Patch. 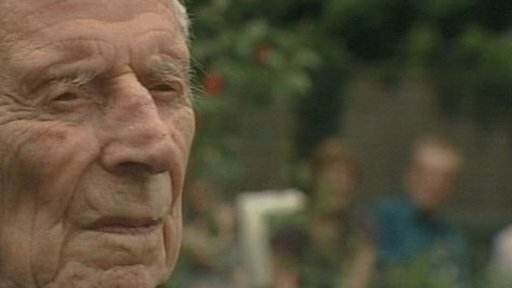 A look back at the life of Harry Patch - Britain's last survivor of WWI trenches. Hundreds gathered to get a ticket for the memorial service.